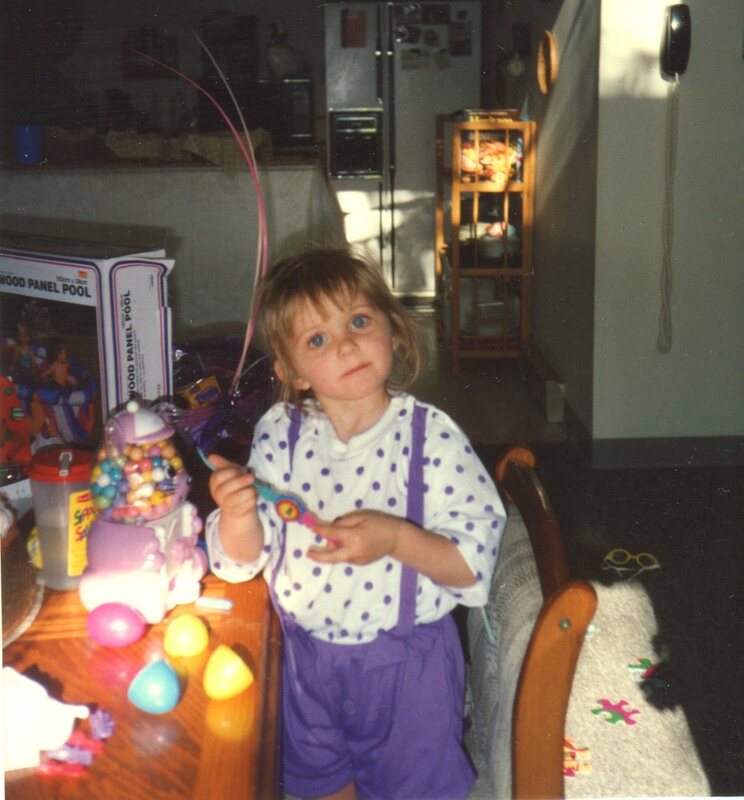 How do you celebrate, EASTER? When you have “Grand-Children” EASTER is like CHRISTMAS, go to CHURCH as a FAMILY , and stop by a RESTAURANT for BREAKFAST and make that a great big BREAKFAST, since for and during all of LENT, everyone was on a low food intake and did without a lot of the regular “FAST FOODS” while just trying to be ever mindful of the season and trying to do with less food, make that, a whole lot more of doing without than at any other time of the year! 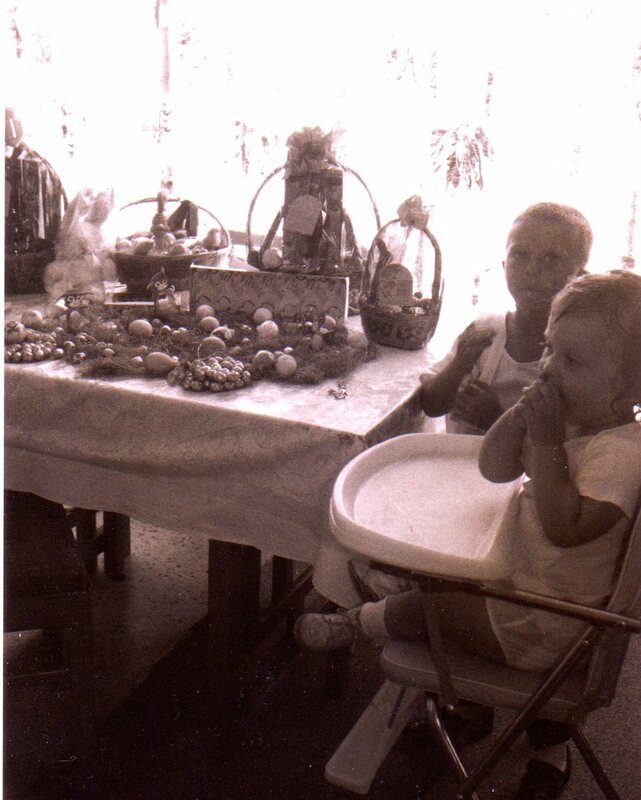 So, in the PHOTO below, we see “ALYSSA” and as you can see, she is not being disturbed by the number of relatives, coming in and bringing “EASTER GIFTS” for her and her sister, “JAIME”. Whatever she is doing, nothing is stopping her from this very important task, that she is working on, so that it will be done ‘right’ because, I know “ALYSSA”, and she is very thorough in completing, that which is most important, as it must be done with precision. This next PHOTO is of “JAIME” and she is a year younger, and has all the qualities as “ALYSSA,” as she learns by watching what others do, and usually ends up doing a much faster job, since both girls work together on so many projects, in my book, it is so wonderful to have a sister so close in age, that you both can do things much better, since there is something in that old saying, “two heads are better than one” and I believe that my two “GRAND-DAUGHTERS” are “A # 1” in all that they do together. “HAPPY EASTER” to everyone , and do remember that the “ALMIGHTY YAHWEH” is the LIFE of this world and “YAHSHUA the Messiah,” is the real reason for celebrating with, HIS VICTORY over DEATH! D.V. Posted in Grand-Children, Grandma and tagged "Mickey McLaren" -" herself"with no comments yet. When it comes to EASTER – what can one say that would be better, than anything ever said, before? Everyone does go to Church for EASTER and CHRISTMAS -but, do they go to Church any other time of the year? These are two days that, when you have small children, you just have to surprise them, with all kinds of good things, candy, treats, and even toys that relate to that day, and since there, just is not enough time in one day to do everything that, would come as a great big surprise for your children – you do have to do all of these surprising things, in two or three days – just so that all basses are covered, and everyone feels that they have shared the FUN and RESPECT for the day – in a way, that all FAMILY members feel very good about doing even more, for next year! Now this PHOTO, above – is “TOP DRAWER” stuff! 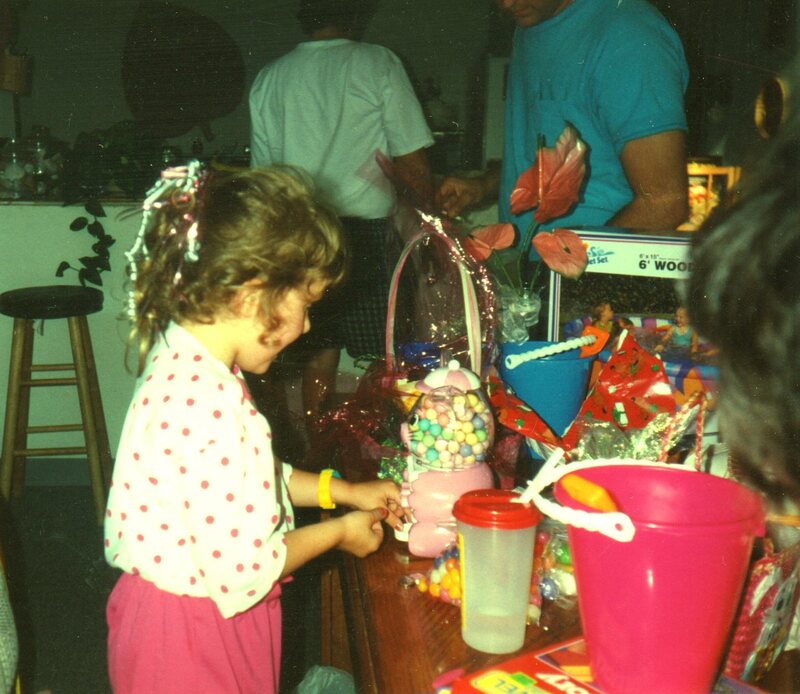 All these many years of getting things ready and set up for EASTER or even any other HOLIDAY – I just think that the above set-up, for EASTER takes a “Blue Ribbon Award” – if, I say so myself! 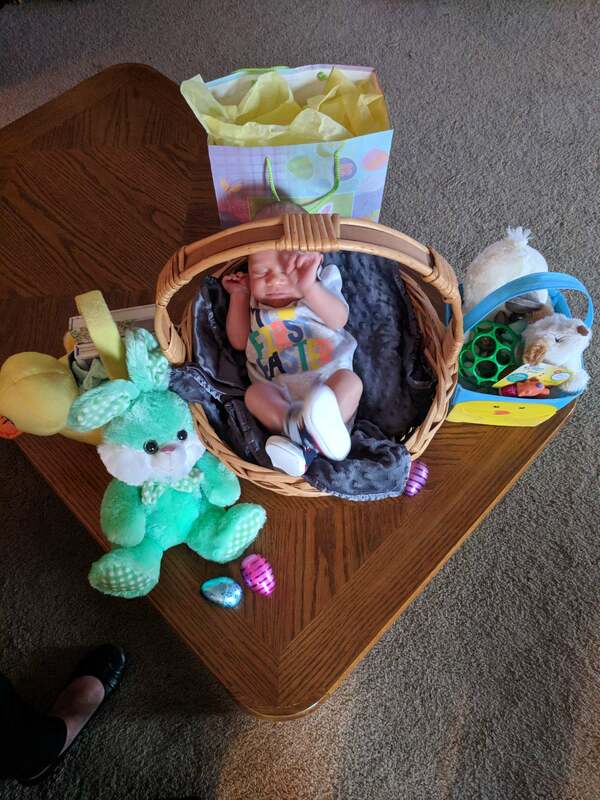 That is my “Great Grand-son, LEX, himself – just the best looking “EASTER BASKET” filled with the best of all the best of gifts for a FAMILY to have on display – in his very own basket, surrounded with such wonderful gifts, that, when he is older and looks at these PHOTOS – “LEX” will certainly know forever – that, from day “ONE” that, he was always wanted – and in this PHOTO, it just shows, how very much he was LOVED and WANTED – just tops everything else in this world! Easter Sunday and an “EASTER BUNNY” is all foreign information, for a fifteenth month old baby, and we can see that, “baby Al” sitting in the “high-chair” just has no real idea of what all that stuff is doing on the dining room table, and so early in the morning? The table is set up, for four boys, “Tom” in high school gets the smallest basket, and for “baby Al” the youngest boy, gets the largest basket, but it is not the size of the basket that makes you feel good, it is all of the sweet treats that are spread out on the table, that, when being bigger and older, you already know , there is more that your hand can reach for and grab, “all” without any help as every thing on the table is there for a variety of tastes, for each boy to enjoy what they like, while they just share and even enjoy sharing with their class mates, when they will be coming over! That’s big brother, “Lee” serving baby brother, “Al” with some of the “EASTER” treats, the ones he knows he can give to “baby Al” but, he is big enough and knows what he likes, as Lee has been around a little longer, and NOW can tell, his little baby brother, “Al” all about the way, that things happen on “EASTER” so nice to be the bigger brother, the one who NOW knows and has all of the answers and just knows so much for being a, “so” big four years old. “PHOTOS” taken along time ago always, have a good story, and do help one to remember the “GOOD” old days!” *** ******* D.V. Posted in Childhood, Grand-Children, Grandma and tagged "Mickey McLaren" -" herself"with no comments yet. This is Jaime’s Wedding day PHOTO with her sister, Alyssa – and they both have those beautiful eyes of the IRISH – and their smiles, make the whole wide world feel all the LOVE, that we all have – and we, will all have, even more – when we share our LOVE with others! So, “WHO” else, do you remember – that sings , “When Irish Eyes are Smiling” – but the one and only “Bing Crosby, himself” from way back in the 1940’s – that is what, I remember. Sometimes – one just likes to hear some really good “Irish Music” – so let’s take a listen to the “Irish Tenors” – and let me know what you think? This is one old song that my MOTHER just loved – so much so that, when we were in the ORPHANAGE – she brought me the music, for “Toora Loora Looral” and wanted the NUNS to give me music lessons – even willing to pay extra – just for me to learn – but – they said you can not afford these lessons – and did not teach me to play the piano. I still have the “MUSIC Sheets” – I did have my children learn to play the piano and the organ and several other instruments – only because, I did not get the opportunity to learn – and I do believe, that all young children should learn to play MUSIC – and have the pleasure of music for the rest of their Lives – if they want that, as some are more gifted than others, and would like to follow a dream, – at least they can, if only given a chance to develop more brain cells – which will then, be a part of their LIFE – for all of their years. “Just a little extra song, “I LOVE YOU TRULY” which most women LOVE when, they are getting married – as I have the old silver music box, that still works – and that is the song that you hear. This little old silver box is sitting on my “Coffee Table” as where else would you want everyone to know, about it and the song. My Aunt Irene Brady Riley” received that as a Wedding gift early 1900’s – and it was a special treasure to her – all the days of her LIFE – and NOW – I am the keeper of the old stuff that was left behind – and it will be available to someone else – soon – just to see how long that piece of “MUSIC” will continue to sing out, those extra special words to the “LOVE of your LIFE” – “I LOVE YOU TRULY!” D.V. 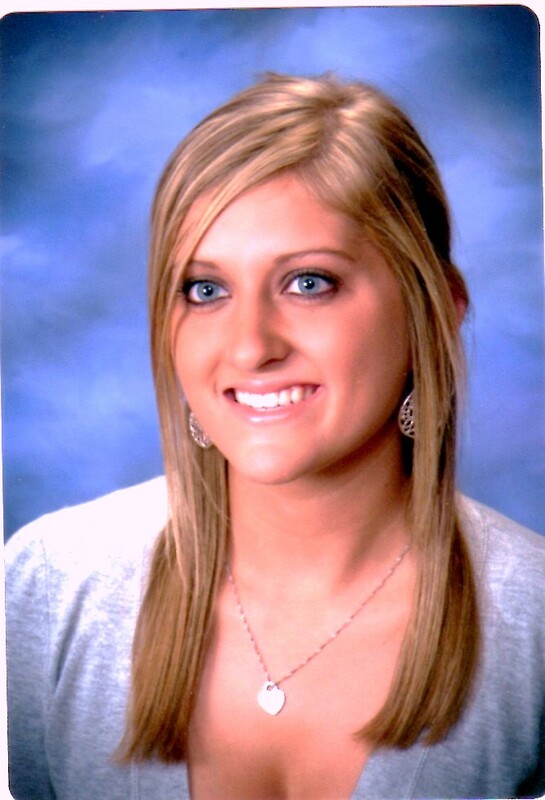 The day 4/4/2015 was a spectacular day for Jaime and Tyler – with all all the FAMILY and Friends – those near and dear, to be all together in a celebration that united two wonderful young people and their families – because this was the plan, for a most wonderful LIFE! This is one of my favorite PHOTOS of Jaime and just have to add it here – so that everyone can see that Jaime is just wonderful – she expresses Love and Sunshine in this PHOTO to all – as she just LOVES to help all of us – with all of her heart. D.V. Posted in Grand-Children, Today and tagged "Mickey McLaren" -" herself"with no comments yet. Sometimes – Come to think of it – I do… do that which, I am told to do! Not always, but most of the TIME. So take a look at the “Post-Card” below. 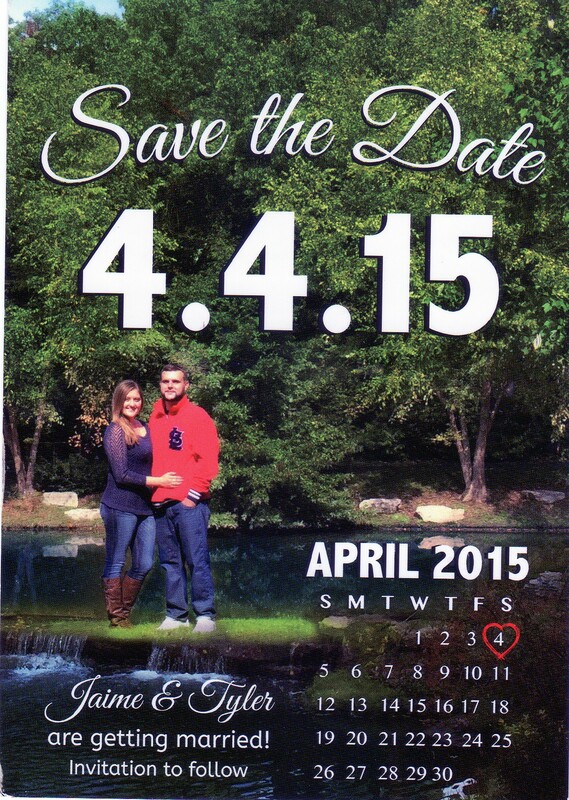 How and or why, did I just now, run across this card, the other day – and now, I am wondering what this means – “Save This Date” 4.4.15 as I remember – I did save that date 4.4.15 and, I did attend the wedding of Jaime and Tyler, but – for me to find this card – right before this DATE 4.4.15 again – must have some special meaning, so I am posting this message to save this DATE – as I do not want to forget what happens on a special date, that you should save, and be ready for and able to appear at a very special function – to which lots of FAMILY and FRIENDS will all be there – and with special TIMES for different things to take place – and each and everything must be done at the proper prepared TIME – so as to have a WONDERFUL MEMORY – to last a LIFE TIME, for one and all ! What I really like, is that sometimes, things just seem to fall into place – and at the exact and correct TIME. I may have read something to that effect in the BIBLE – that everything is in its place at all times – otherwise we would have complete “Chaos” and who in the WORLD wants to be cleaning up one mess after another – so I like the way it is – that, things have a way of being right there – in plain view – just when you may need them, for the purpose of being useful. 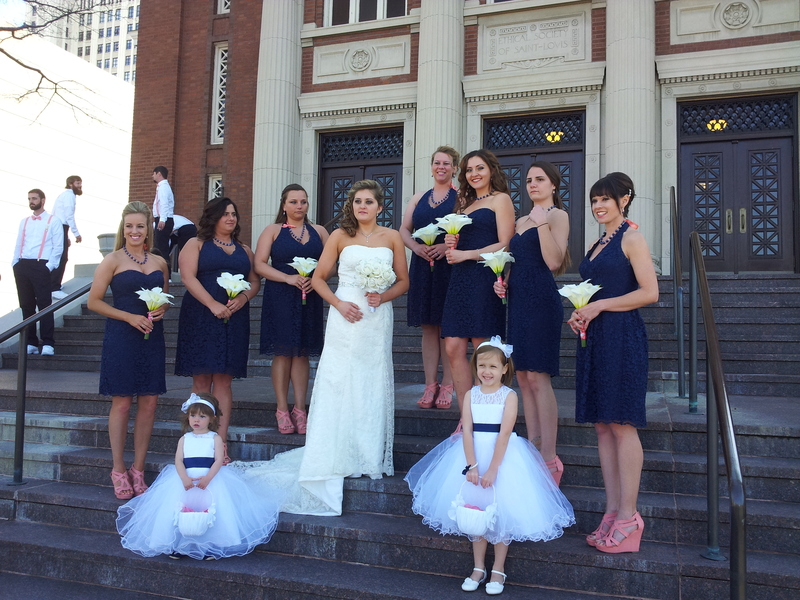 Just thinking back and looking, at the above PHOTO – this is one beautiful “WEDDING PARTY” – if I say so, myself! “WOWEE” Just to think about being young and beautiful and doing all of these wonderful things – with such style, and then, having so much FUN and the ENJOYMENT with each of these wonders that are available today – making our LIVES so happy – just to be alive! Just have to give THANKS to our Almighty CREATOR – as He blesses each and everyone of us – with as much as HE can – just to make our LIVES so worthwhile – knowing that, one day we will enjoy even more – and that will be for all eternity! D.V. Some DAYS are, “Super Fun DAYS” and that is what “TODAY” is, – “It is April 1st” – and everyone knows – this is the day to have FUN – playing silly jokes on our family and friends – when they least suspect that something silly will be happening to them! 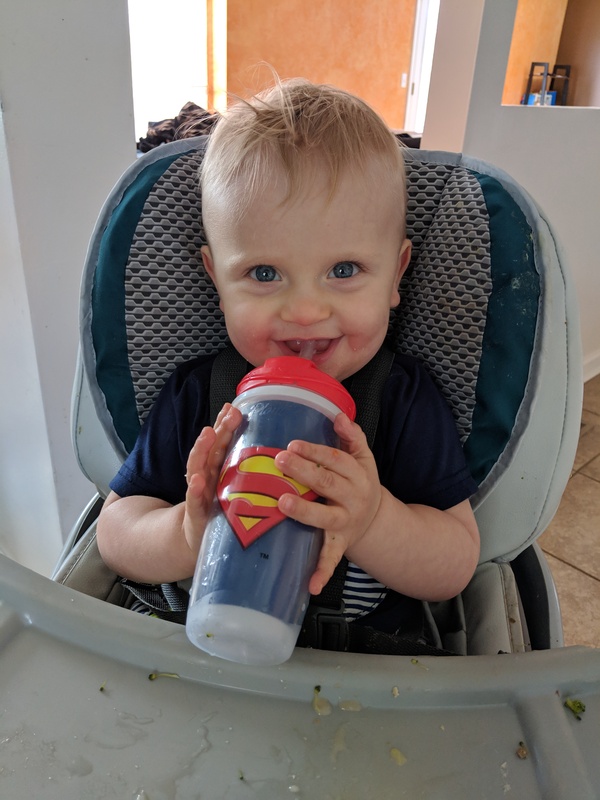 This is young “Super MAN” and he is drinking some of his “Super Duper Drink” because, he is an extra special “Great-Grand Son” and when, he has had, just the right amount of his special drink, coming from the special cup with his extra special identification stamped – right there on the front – for all to see – so that, we will all know, who he really is – just keep on watching – because, “Super Lex” has big plans – you can tell – “IT” is, as plain as day, on his face! “April Fool’s Day” – to you all! 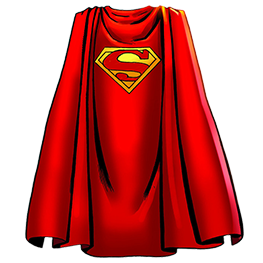 “SUPER MAN” will throw his “extra special CAPE” on to his shoulders and up and away, he will FLY, higher and higher into the “BIG BLUE SKY” and within just “FORTY WINKS” – before anyone will know, that he has left – “Super Lex” will be at “Great Grandma’s” house – just to give “G-G” more “BIG SMILES” – in person, with lots of LOVE – as only he can do! “It is only – a once in a year – for our April First Jokes – to just maybe even, turn into a real happening – so before the “DAY” is over – make the most of it!” D.V.